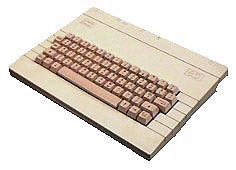 The keyboard was almost the same as the original Atmos version, including a MK key, similar to the CTRL key, a C/L key allowing to display Cyrillic or Latin alphabets, and cursor keys. As in Pravets 82 (etc), the original lowercase characters were replaced by cyrillic characters and the C/L lock key, was the CAPS LOCK key of the Oric Atmos. Like the original Atmos, The 8D had two modes of recording : Fast mode at 2400 bits/sec. and slow mode at 300 bits/sec. The computer also featured a parallel Centronics interface and a user port. Pravetz provided a local dot matrix printer called "Petritch" but the popular Epson printers could be also connected to the 8D. The "D" after Pravets 8 stays for "�������" (Domashen = For home use), and the idea was, that it should be used without having to buy any peripherals - monitor (which couldn't be connected through composite video to a Pravets 8D without modification) and FDD (cassete recorder used instead). Floppy drives, modem and joysticks were also available. Floppy disk drives were very hard to find (in fact they appeared only in the early nineteens). They were a modification of the Pravetz 82 FDDs but with a built-in controller, making them two times bigger. Probably that was one of the reasons why Pravetz 8D never achieved the popularity ot Pravetz 8 (despite of the 3 times lower price). There were in fact two ways to have floppy disk drives for the Pravetz 8D. One was indeed to use Pravetz 82 FDD and to develop an additional controller + power supply (the schematic and firmware were published in "Computer for you" magazine). There was an operating system called DOS 8D, developed in Bulgaria by Borislav Zahariev. Later, Pravetz factory decided to develop special FDD for the 8D, which was bundled with the controller and the power supply in a box twice bigger than the normal Apple ][ floppy. It came out on market when the production of the computer itself was finished! It used also modified version of DOS 8D for DIY floppy. The computer was very well crafted and the survived systems often look as new. There are several rom images of the basic in Pravetz. If you wand disk emulation you need 8DControllerROM and use CALL#320 command. to go in RAM interpreter and make changes in it. You must write it from addres #20 of the EPROM. pin 9 of 74LS74 is connecting to A8 addres bar of 2716 EPROM, so the "additional thing" is second page of the EPROM, where is the program of loading DOS 8D v.2.1 into additional RAM. (The record of the EPROM above is exatly for first and second page). Dos 8D v1.0 - you can use it if you realise only the schematics of the disk controller, but this versions loads in normal RAM, so it is unusable with long games. Dos 8D v.2.1 - you can use it if you realise the two schematics and connect them. So - dos loads in additional RAM and you can use all the programs you have. You can use regular Oric software in Pravetz 8D, but you have not regular letters. You have cyrillic letters instead. Changing of the keyboard maps is with Ctrl-T. There are some games for Pravetz like SnakeByte, Tetris (exellent clone) and other. Most of them are from Bulgarian computer magazine "Computer for you". There is 80 column text editor, Disk copier program and the most beautiful - Borislav Zahariev ported BigMac Assembler from Apple ][ to Pravetz, so you can use if you realise schematics above. Soon I hope you will see this software here. see more Pravetz 8D Ebay auctions !